Background : He lost his right leg serving overseas. 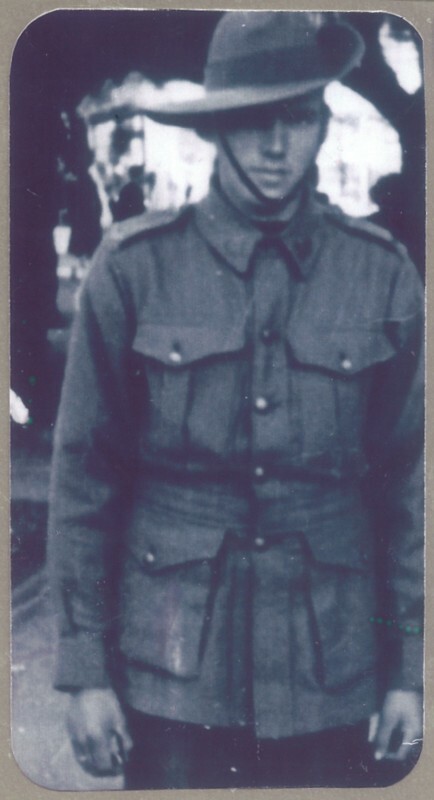 His best mate was VX19030 Gordon Keith Dobson who died on the Burma Railway. Darren Shelton's (donor of this information) uncle was named Keith in his honor. Son of Charles Edward Shelton. Service & personal summary At enlistment : single. No previous military experience. At discharge : height 5 feet 8.75 inches, hazel eyes, dark complexion, dark hair. Marital status : married. Marks / scars : scar on right leg. 710 days active service (including 238 days service abroad). 12/09/1940 Admitted Puckapunyal 4 Australian General Hospital, Seymour, Victoria with ruptured medial meniscus (knee). 26/06/1941 Wounded in action gunshot wound. 27/06/1941 Wounded in action gunshot wound. 14/07/1941 Further to injury, amputation right leg. 06/07/1941 Evacuated to 1 Australian General Hospital for amputated right leg and transferred to X list. 20/09/1941 Medical classification assessed permanently unfit for service by medical board. 03/11/1941 1 Australian General Hospital amputation right leg for XXXXXXX Australia. 05/11/1941 Embarked in the Middle East for return to Australia as medically unfit. 01/12/1941 Disembarked Melbourne, Victoria ex Wanganella. Reason for return amputation right leg through thigh. Leave and report to R. & T. Camp Caulfield, Victoria 12/12/1941. 01/12/1941 Taken on strength R. & T. Camp ex 2/2 hospital ship. 01/12/1941 Granted disembarkation leave 01/12/1941 to 12/12/1941. 12/12/1941 Evacuated to 115 Australian General Hospital, Heidelberg, Melbourne, Victoria and posted to X list. 12/12/1941 Admitted 115 Australian General Hospital, Heidelberg, Melbourne, Victoria with amputated right leg through thigh. 07/01/1942 Transferred to R.G.H. 6 Caulfield, Victoria. 07/01/1942 Admitted amputated right leg. 24/02/1942 Transferred to 115 Australian General Hospital, Heidelberg, Melbourne, Victoria. 24/02/1942 Admitted amputated right leg. 07/04/1942 Discharged to Reception Camp area. 07/04/1942 Transferred from 115 Australian General Hospital, Heidelberg, Melbourne, Victoria.